I love dogs. In fact, I love dogs so much that I don’t own one. Between my work and my lifestyle, I am rarely in a position these days to provide substantial care and companionship for a living thing that without my support, is permanently at risk of death by boredom, starvation or both. As great as they are for morning face-licks and openers with cuteness-captivated women, in my world, a dog would spend most of its time alone and that just wouldn’t be fair. Leo Trottier, Founder and CEO of CleverPet gets it. CleverPet is essentially a “game” console for pets with three key elements: a food feeder, three lucent touchpads and an intelligent software program that is designed to execute onboarding, progressive learning and ongoing game play while managing food dispensing with extreme precision. You fill up the device with a day’s worth of food and through a series of cues and interactions, the dog stays cognitively (and physically) engaged as it gets fed. But it’s not like the touchpad gaming isn’t well thought out too; the 3-pad model has been used many times by people who have studied animal behavior for quite some time and on the CleverPet team alone, there is a PhD in Neurosciences, a PhD in computational Neuroscience and a nationally recognized dog trainer. Leo himself is a PhD candidate in Cognitive Science. First, the device just feeds the animal – “Oh, this thing gives me food. I guess I should care about it.” Then, then device will start lighting up a pad without dispensing food – “Oh, this thing stopped feeding me. But now there’s a light flashing. Maybe I should care about that light.” Eventually, light patterns are expressed for repetition and reward, and before you know it, you’re back at home and your dog is reading Nietzsche. All things considered, they seem to be barking up the right tree. 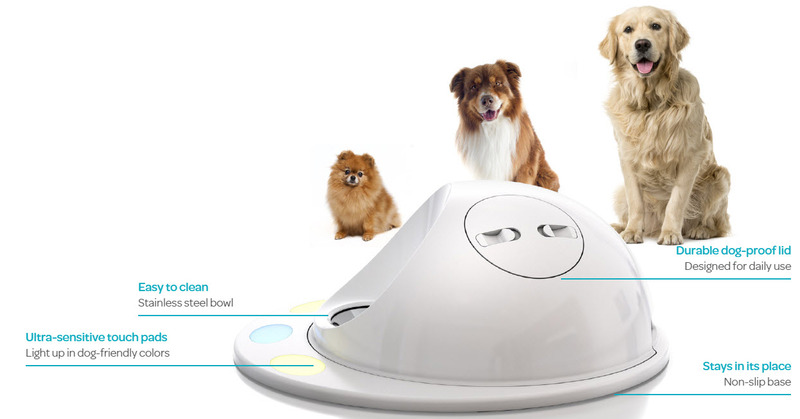 In the average day of a dog, an afternoon with CleverPet certainly sounds like it beats a fuzzy bed, a frayed rope with nobody at the other end and a few overstated crotch-sniffs. Their first batch of about 1,000 units will be shipping in the next 4-6 weeks (2/3 in the US, 1/3 international) – you can contact the team for more information or hop onto their waiting list on their website. CleverPet originally secured about 500K in funding last year and is currently in the process of raising another $1 million in seed funding. I always appreciated people that could understand they did not have time for a dog or cat. This is pretty neat and of course works on an incentive basis, but that is how you get a dog to do just about anything you need them to do, right?